Nevrio a traditional sweet of Goa is prepared in every home during Christmas. This is a traditional half moon shaped sweet prepared in most of the homes in India on auspicious occasions and festivals. A delicious dumpling made of wheat or Maida. The stuffing inside varies. Can be made of dry fruits, Semolina, dedicated coconut or Khoya/mawa. are the different names of this delicacy savoured by all. 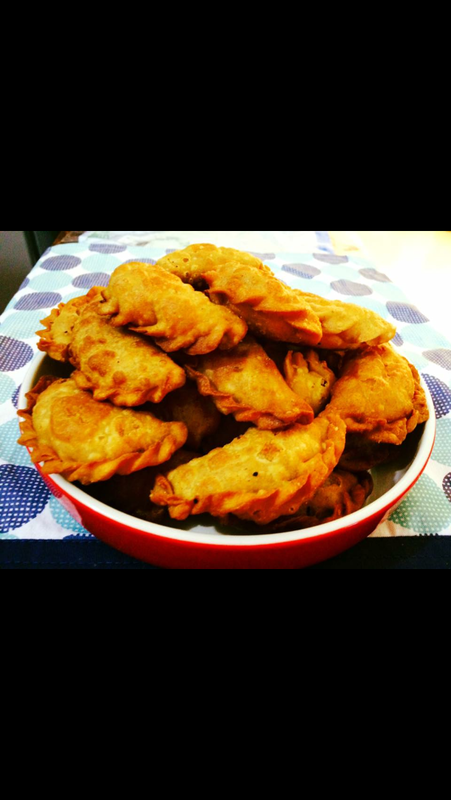 I have used wheat for the dough ie the outer cover and the filling is melt in the mouth mawa with dry fruits. For the filling- 1cup mixed chopped roasted nuts like almonds, cashew nuts , pumpkin seeds, walnuts and raisins. 2 table spoons suji rava roasted. Dates-5 to 6 chopped. Ghee-1 table spoon. Knead 1 cup of milk powder with a little ghee and 2 table spoons of milk to a soft dough and then cover it in a wet cloth and steam it fo about 5 mins without the weight in a pressure cooker) Once it cools crumble it and keep aside. In a kadai add 1 table spoonful ghee and add khus khus, add the crumbled mawa and on low flame keep stiring till the mawa changes to pinkish colour. Add the chopped nuts, raisins ,roasted rava and chopped dates and mix it properly.Add the powdered sugar and also the cardamom powder. Mix well. Knead into a firm dough and keep it covered with a wet cloth to prevent it from drying. balls and roll them into small sized rotis and fill a spoon full of the mixture and seal the edges with the tips of the finger or slightly twisting the edges with the fingers to seal them. Fry them on medium heat to a golden colour. 1cup mixed chopped roasted nuts like almonds, cashew nuts , pumpkin seeds, walnuts and raisins. Once its cool crumble it and keep aside. In a kadai add 1 table spoonful ghee and add khus khus, add the crumbled mawa n on low flame keep stiring till the mawa changes to pinkish colour. Add the chopped nuts, raisins ,roasted rava and chopped dates n mix well. Add the powdered sugar and also the cardamom powder. Mix well. In a pan add salt, wheat flour ,suji and ghee and mix with light hands. Slowly add cold water little by little and knead into a firm dough. Cover with a wet cloth and keep aside. After about 15 mins divide the dough into small balls and roll each ball into a small puri. Thinner the better. Put a small spoon of the filling and seal the edges lightly with the fingers and twist them with the fingers to seal the filling and prevent them from opening while frying. Now heat oil to fry the karanjis and once the oil is hot fry the karanjis to golden brown.